BOURNEMOUTH HAVE SIGNED goalkeeper Asmir Begovic from Chelsea for a fee believed to be in and around €11.5 million (£10 million). The Bosnia-Herzegovina stopper has been playing second fiddle to Thibaut Courtois at Stamford Bridge since joining the club from Stoke City nearly two years ago and heads south in pursuit of first-team football. Begovic managed 33 starts in two seasons at Stamford Bridge, and just two of them came during Chelsea’s recent Premier League title-winning campaign. The Canada-born 29-year-old will be competing with Artur Boruc for the starting spot between the sticks at the Vitality Stadium next season. Begovic will be familiar with the club having been on loan there in 2007, when he was on the roster at rivals Portsmouth. “I want to show people what I am capable of,” Begovic said. Bournemouth boss Eddie Howe added: “Asmir is an outstanding goalkeeper who has proved himself capable of performing at the highest level over a number of years. “He is at the right age and the right fit. He is a leader as well and exactly the kind of character you want in the team. “Asmir will provide great competition to the excellent group of goalkeepers we already have here and his experience will prove invaluable in the dressing room and on the pitch. 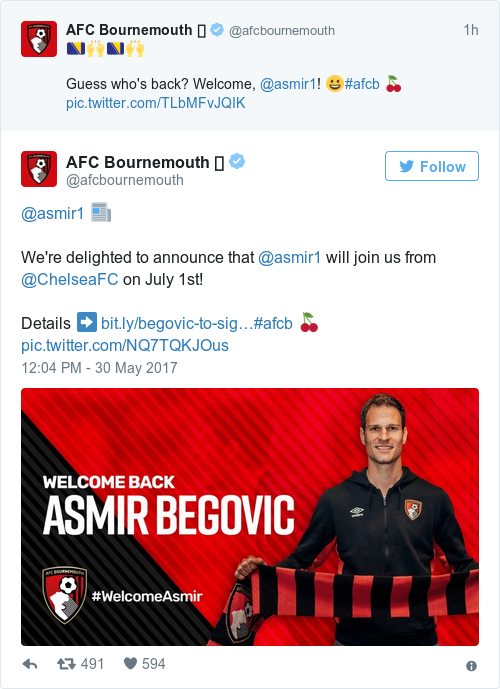 Begovic will officially join the Cherries on 1 July. Email “Bournemouth splash out €11m on Chelsea stopper Begovic ”. Feedback on “Bournemouth splash out €11m on Chelsea stopper Begovic ”.